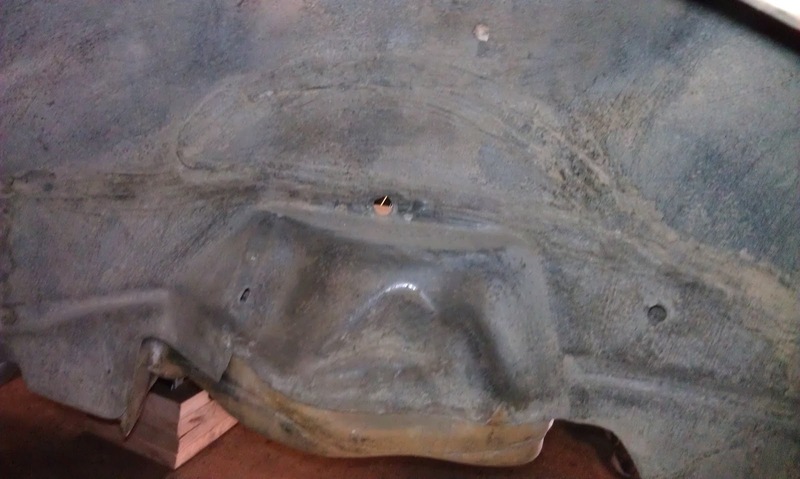 While he was under the car he noticed we had failed to remove the passenger side fender brace. Three bolts later it was off. 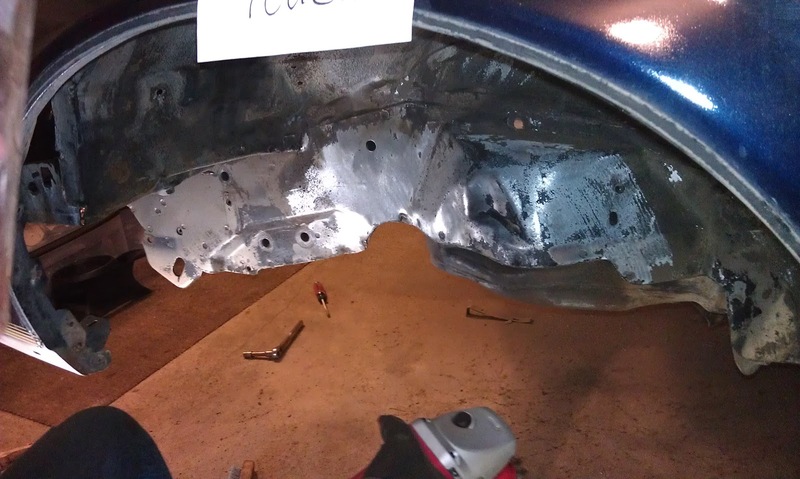 I wire brushed the passenger side wheel well to knock as much loose dirt off as I could. Here is my finished product. While I was working on the passenger side wheel well, Jonathan was attacking the driver side with a wire cup brush on the angle grinder. 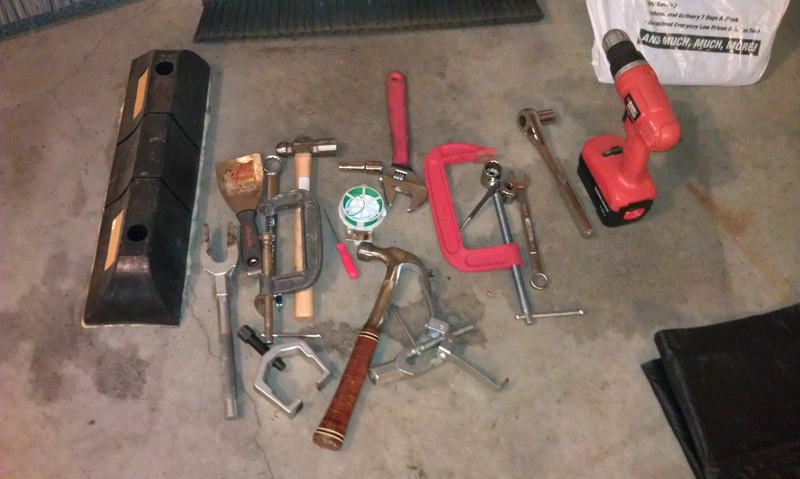 I finished the passenger side wheel well and Jonathan was still working on the driver side, so I cleaned the tools we had piled together last night and put them away. I took a picture of these motor mount rubber bushings because I threw them away when I was cleaning. 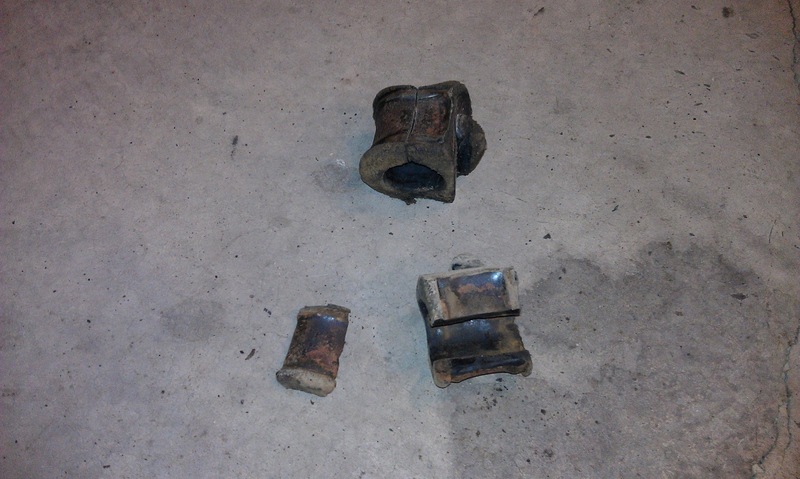 We are going to replace these with polyurethane bushings. This is the fender brace Jonathan removed from the car this morning. I brushed it clean with the wire brush and then added it to the pile of parts my dad cleaned last night. 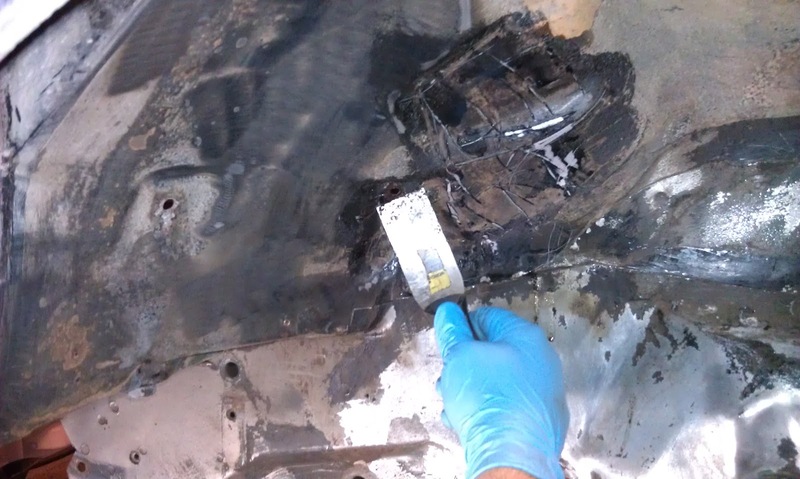 While I was doing all that, Jonathan determined the wire cup brush was burning the undercoating off the driver side wheel well. (Oh, is that what the burning rubber smell is?) 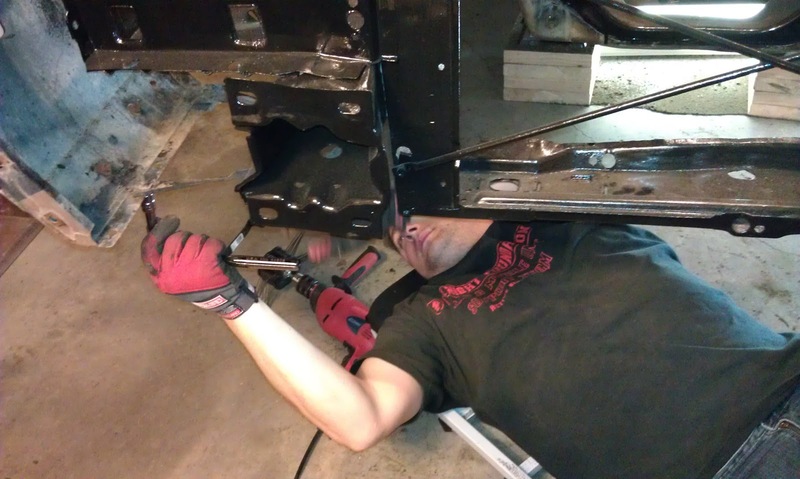 Jonathan decided to try a little bit of POR-Strip in a small area in the wheel well. 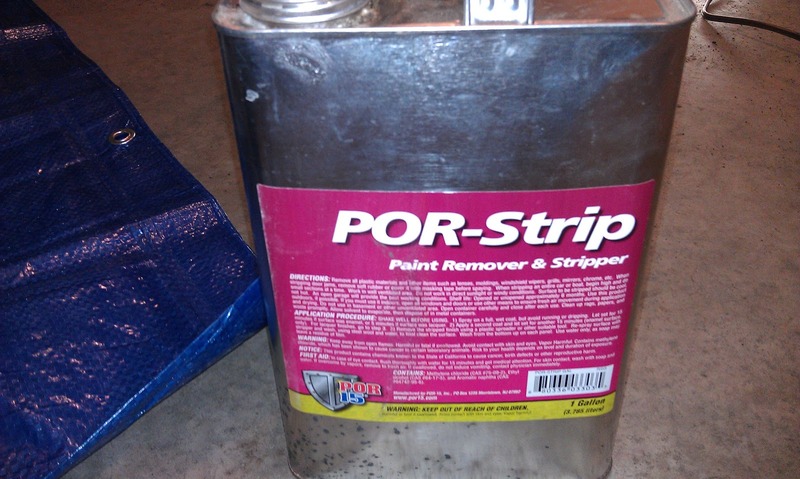 The POR-Strip seems to be effective at removing the undercoating and paint in the wheel well. Jonathan decided it probably would save us a lot of time to just coat the wheel wells with POR-Strip and scrape it off. 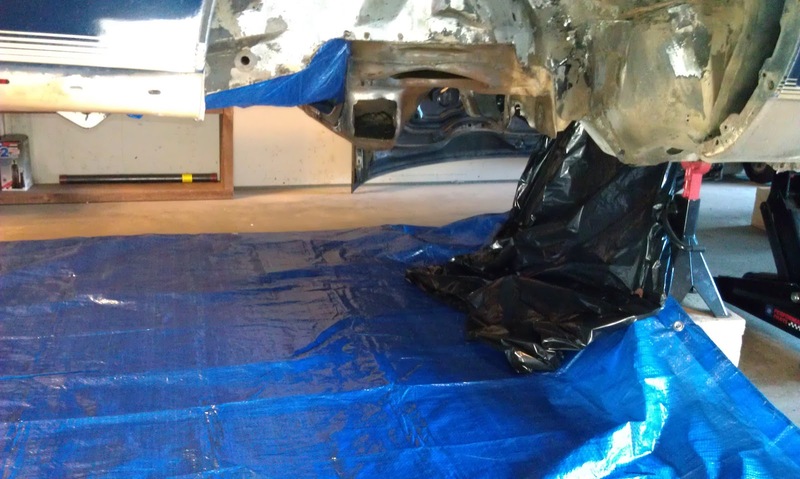 We decided to put this off for another time and finish prepping under the engine bay area today. We put a cinder block under each corner of the tarp and secured it with duct tape. 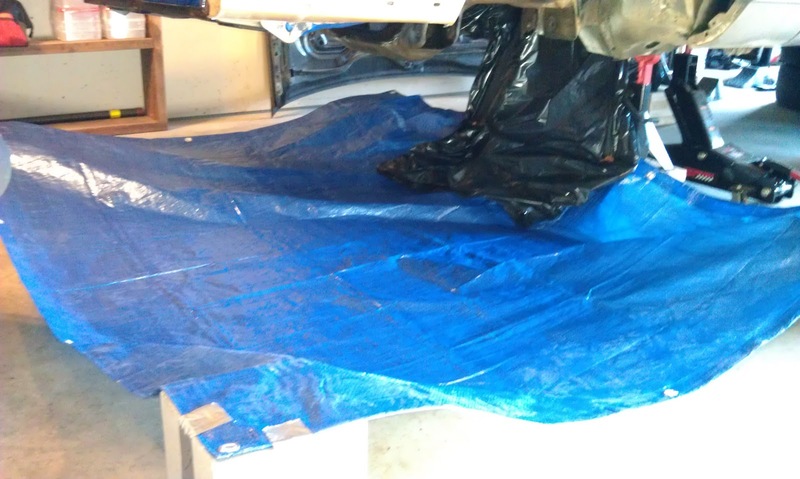 This raised the tarp up to form a bowl and kept the water from running off the tarp. Jonathan worked under the car and I worked on all the parts my dad brushed last night. We both followed the same procedure. We sprayed everything with MarineClean and let it soak for about 10 minutes. Then we sprayed another coat of MarineClean and scrubbed it clean. Then we sprayed a little more MarineClean on and let it soak for just a few minutes. Finally we rinsed everything off with hot water. Next we sprayed everything with Prep and Ready and let it soak for 30 minutes, spraying every so often to keep it wet. After half an hour had passed we rinsed everything good with clear water. 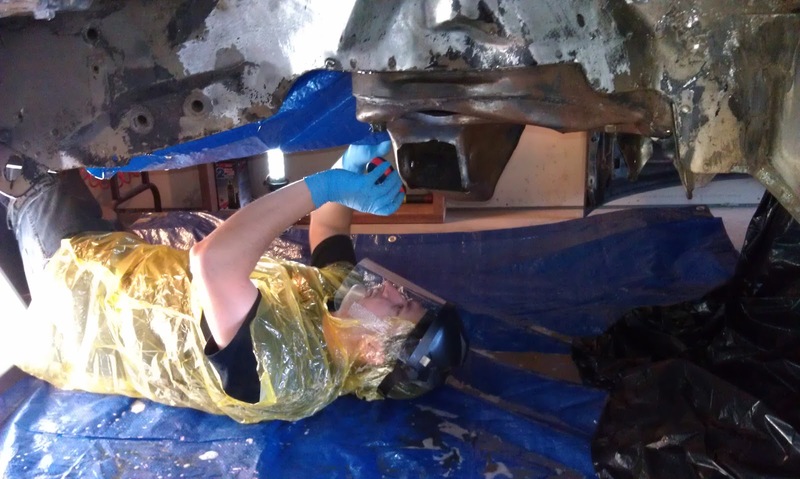 Jonathan wore a disposable poncho and his face shield to clean under the car. I was very happy to be cleaning the parts outside instead. 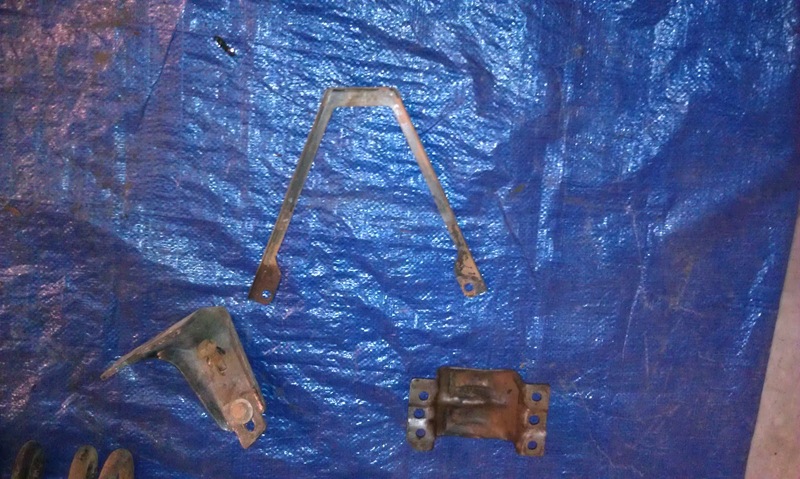 Here are all my parts after they had dried. Don't they look beautiful? Since Jonathan has endorsed a few products on this blog already, I thought I would mention what I consider to be an awesome necessity for Project: K.I.T.T. 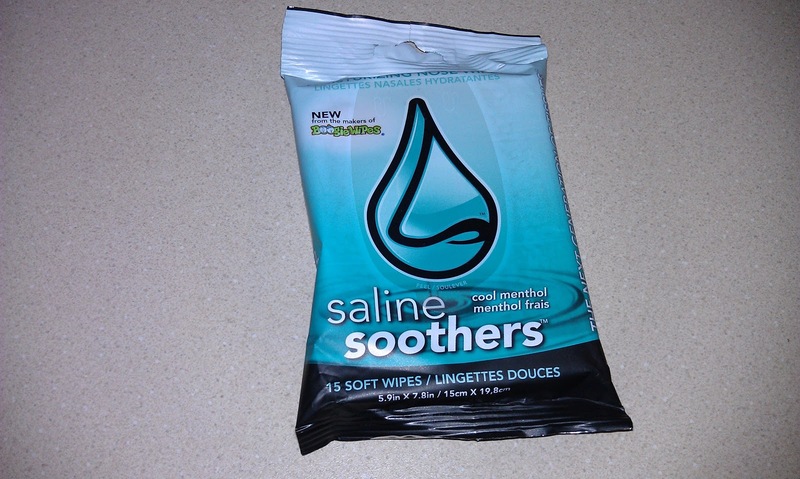 These are called Saline Soothers moisturizing nose wipes and I really like the cool menthol scent (they come in unscented too). They are seriously awesome. I would be their spokesperson in a heartbeat. It is probably little gross, but when you have been breathing in all kinds of dirt and dust, they are really great at getting your nose cleaned out. 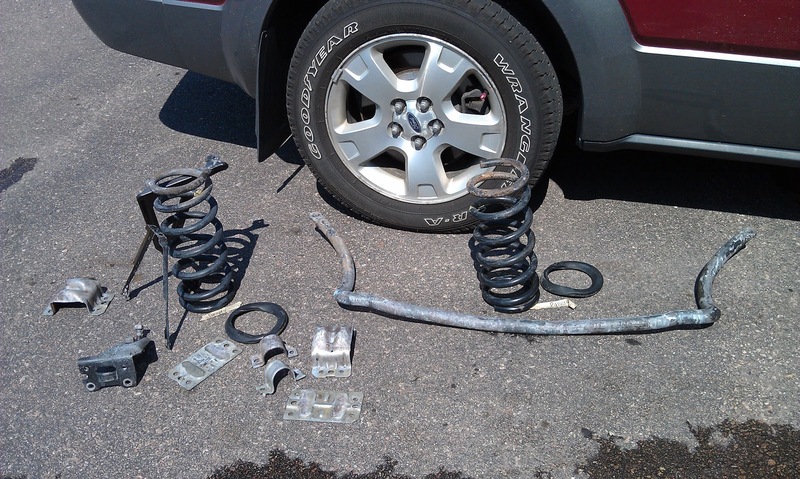 After we cleaned and prepped today, we returned the Ball Joint Press to O'Reilly Auto Parts. We really did receive a full refund. I think their rental program is amazing. 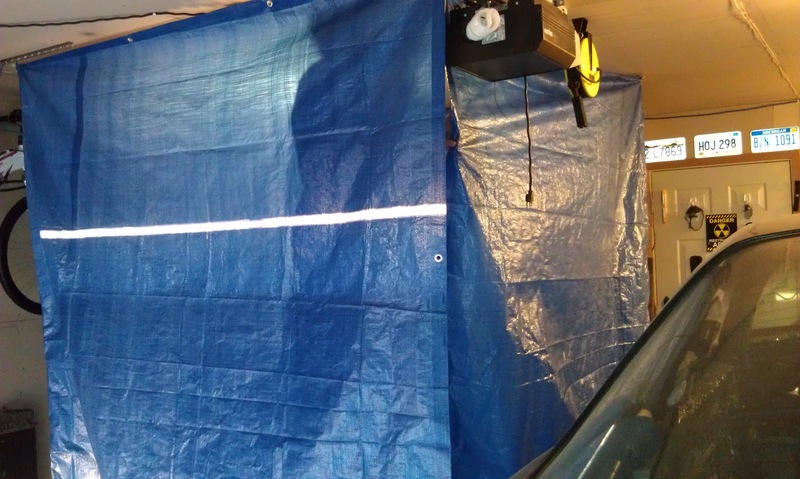 Tonight we organized and cleaned the garage a little more, and then installed a paint booth made out of tarps duct taped together. We put it up tonight to use for something non-KITT related, but it will be used to paint all of KITT's plastics and other parts in the near future. We put hooks in the ceiling so the paint booth can be easily taken down and put up when we need it.